Sweet Appam is prepared during festivals like Krishna Jayanthi and Karthigai Deepam. I have used raw rice and wheat flour to prepare this appam. The appam was delicious and we all loved it very much. 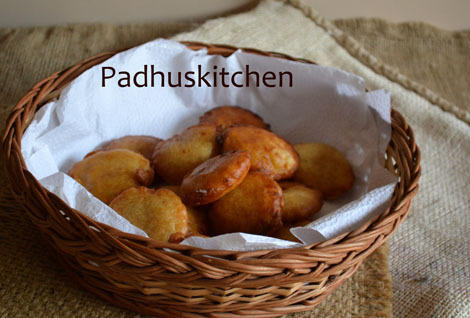 I learn't this recipe from my perimma (aunty).Today we will learn how to make sweet appam following this easy recipe. Drain the water completely and grind the rice first in a mixie.Then add little water, grated coconut, cardamom powder and grind it to a smooth paste.You can rinse the mixie with 2 tbsp of water and add to the batter. Add grated jaggery to it and mix well till it dissolves. The batter need not ferment, you should make appams immediately after grinding it. Heat oil in a small kadai, keep it in medium flame, take a small amount of batter in a table spoon or small ladle and drop it gently into the oil. When it puffs, turn over and cook the other side also till golden brown. Drain the oil using a slotted ladle and take it out from the kadai. Deep fry one appam at a time. Sweet appam is ready to be served. It can had as a tea time snack. Note - You can adjust the amount of jaggery according to your taste. Nice & delicious looking appams!!! This is my fav sweet.thanks for posting dis. Delicious and mouthwatering sweet appam. Looking forward to prepare it. Delicious, one of the sweets I want to try soon! Feel like eating some,my fav appams. what if i have soaked rice for more that 5 hours. is there a way i can make appa,ms? I tried this for krishnajayanthi today!! It came wonderful.. Very easy and did come out perfect!! Thanks Padu!!! I use 1cup each of rice flour wheat flour and maida and 3cups jaggery turns out really good, will try ur version. 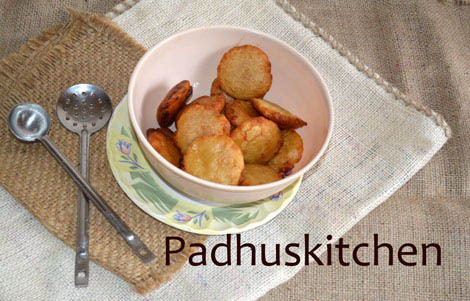 Thank you Padhu, you are blessing in disguise to all newly weds like me. Continue the great contribution to society!!! Great recipe.My mother used to add ripe banana to the batter and it tasted yummy. Instead of soaking raw rice. Will I able to use rice flour. If able. what is quantity to use. Hi , i tried this recie 2day, and even without soda and banana, it came out good..
How many appams we make with this quantity? It serves 3-4 persons. I will update the quantity, once I try it again. Just now did this appam, has come out well. Thanks for the recipe .